There is a very big, 17th century Spanish ship docked bayside on 3rd Street in Ocean City, Maryland. It is amazing. 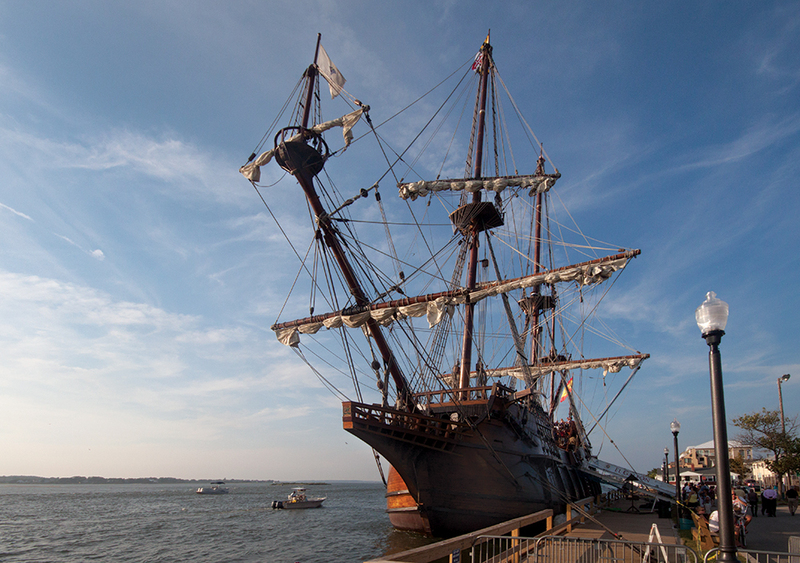 El Galeon Andalucia is her name and she is magnificent. ‘Galleons’ are Spanish trade ships built and used from 1500 to the mid 1700’s. Consider the Andalucia a ‘newer body style’ to the boats Ferdinand Magellan used to first circumnavigate the planet. To describe it to someone that has not seen it is a little hard. She has six decks, 12 guns, 3 masts, seven sails, 170 feet in length, a top speed of 6.7 knots, a gross tonnage of 496 and the top mast at over 10 stories tall. There is a crew of 25 that run the ship and the research alone to prepare for its 2010 completion took 6 years! Just considering the amount of skilled, hard labor to construct the vessel to a seaworthy condition is hard to fathom, let alone to keep it afloat and pointed in the proper direction. In laymen’s terms ‘She’s magnificent!’ And powerful. A little perspective here, Spain occupied land on 5 of the 7 continents back then, excluding Antarctica and Australia. The powerful Galeon’s they built had a lot to do with that. Everyone knows that in 1492 Columbus sailed the Ocean blue.’ He ‘found’ the new world, but not on purpose, he was looking for Asian Spices. The guy needed some cinnamon, and a Western route to get there. For this, he needed a boat, 3 of them exactly. He didn’t get his cinnamon but he did get mankind one step closer to circling the globe. Magellan’s thirst for cinnamon was even greater, he decided he needed 5 Galleons and 270 men to quench it. His crew left to pick up some cinnamon (and don’t forget milk!) in 1519. Three years later he returned, well, he didn’t, his body was currently a war trophy for Philipino Chief Lapu-Lapu. But to Lapu-Lapu’s defense, Magallen was trying to kill him first. Eye for an eye I suppose. Also, only one of the five ships returned with 232 men lost to the sea. The stakes were high for adventure back then. BUT, his exploration made it! In 1522 mankind had circled the earth for the very first time. He did it without maps, without G.P.S., without the internet, without social media, or rest stops with cinnabon, or starbucks or any of our modern day conveniences. He did it by inspiring his crew, and by his own determination to circle the globe! And the boat! Don’t forget the boat. Without his Galleons he would have never made it. What’s awesome is that today, if you want to, you can board the Andalucia, walk out on it’s oak decking and peer out over the hull much the same as Magellan did 500 years ago. Imagining you and your crew out on the open Ocean with nothing to guide you but intuition, a compass and the stars. Imagine seeing the Pacific for the first time, to overcome storms, rival navys and mutiny. Now, that’s adventure! So, from now, until September 2nd, there will be a very large and beautiful Spanish 17th century Galeon on the bayside of Ocean City, down on 3rd Street. Don’t wait until the bitter end and miss it. Savvy?